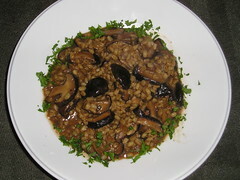 I’ve been meaning to make barley risotto for ages, but just got around to it recently. It is more or less just like making the rice version (see my post of September 30, 2008), but with barley, the kind with the hull removed. I used Shiloh Farms hulled barley. I used Mark Bittman’s excellent recipe in “How To Cook Everything,” one of my all-time favorite cookbooks. His recipe called for dried porcini mushrooms, but I cut back somewhat on those, as I had a good amount of shitakes I’d bought fresh for only $3.69/pound at the Chinese supermarket in Plainsboro. I’d sauteed them all in olive oil and a little butter, and they needed to be used. I used beef broth for a hearty flavor, but it’s easy to use vegetarian broth and have a vegan dish, or vegetarian if you sprinkle a little parmesan on top as I did. The resulting dish was great. Risotto made with rice takes about 18 minutes of stirring. But the barley version takes a good 30 minutes, even a little more, so plan on some extra time and elbow grease. It’s well worth it!